EXPLORE ARIZONA – OATMAN, HOW DID YOU GET YOUR NAME? Imagine being a 14 year old Mormon girl in 1851. In search of a better life, your family decides to move west. Leaving your home state of Illinois, you now find yourself joining other families on the west bound wagon train. 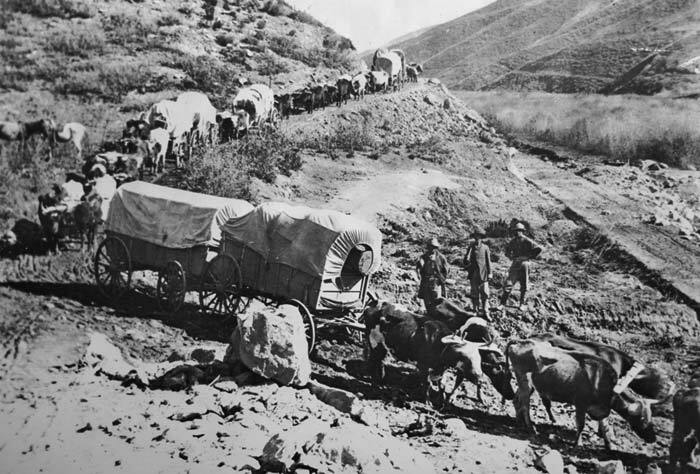 As the days and miles pass, the uncertainty of life on the wagon trail starts to feel rather familiar. Your family has safely crossed into Arizona. Home is becoming more of a reality than simply a final destination. Unexpectedly and out of nowhere, the Tolkepaya Indians attack your wagon train. Within minutes, you find yourself orphaned and parentified. Life would never be the same; both you and your 7 year old sister are now captives of the Tolkepaya’s. 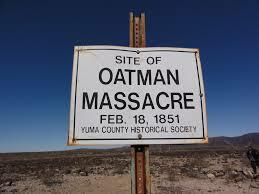 This was Olive Oatman’s reality on Feb 18th, 1851. Olive and her sister served as slaves for one year. The Tolkepaya’s would later trade the sisters to the Mohave tribe. The Mohave adopted both sisters; embracing them as family members. Mary died from a childhood illness shortly after the trade. Olive was always free to leave her Mohave family; however, it would be without their accompaniment. Returning their adopted daughter to a white settlement could mean severe retribution for the tribe. If Olive was to leave, where would she go? Would it be safe for her to travel alone? What if she was recaptured by the Tolkepaya’s? As a tribal member, Olive’s chin was permanently tattooed; five vertical lines, with triangles set at right angles. Would this tattoo be a constant reminder of Olive’s tragic past? Could the blue cactus ink come to symbolize her adoptive family’s love? Would this tattoo represent the loss and love she experienced? 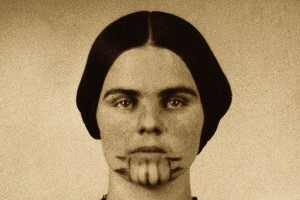 Would white America consider her to be Mohave or embrace her as Olive Oatman from Illinois? In 1855, Fort Yuma authorities located Olive Oatman. Her release was formally negotiated, forcing Olive to leave her Mohave family. How did Olive reconcile the murder of her parents, survive a year of slavery, mourn the death of her sister, and yet manage to rebuild a life with her adopted family? Could Olive remain with her adoptive family? What if Fort Yuma authorities gave Olive the option to live within both worlds? Where was “home” for Olive? Was it the world she no longer knew or was it the place where she felt a sense of belonging? As a young woman, Olive married a rancher, who later became a wealthy banker. The couple adopted a child and lived a comfortable life in Sherman, Texas. A friend once described Olive as a “grieving, unsatisfied woman” who longed to return to the Mohave. By her mid-forties, Olive found herself battling debilitating headaches and depression. It seemed Olive suffered from post-traumatic stress disorder; which resulted in a three month stay at a medical spa in Canada. Throughout the 1880’s, the “tattooed captive” became a popular circus theme. Imagine having your experience inspire traveling side show attractions? Would the modern day equivalent be late night comedians making jokes out of someone else’s tragedy? 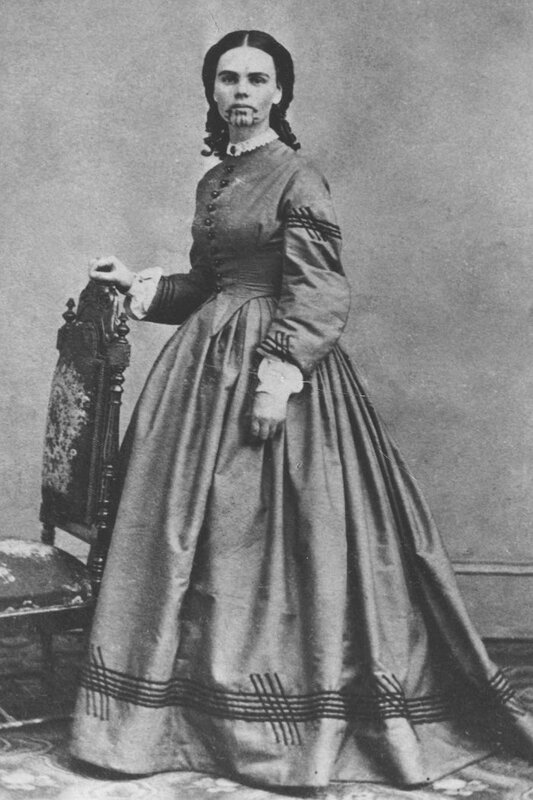 Olive Oatman died of a heart attack in 1903.Three years later the town of Oatman was founded; named after the woman who was adopted by the Mohave. Today, Oatman is considered a ghost town that refuses to die, yet there is no mention of Olive Oatman’s life or will to live. Instead, you will find store front signs that appear misogynistic in nature, and not reflective of Olive’s legacy. This Post was posted in REMOTELEIGH and tagged OATMAN, olive oatman, tattooed captive. Bookmark the permalink. How sad and how interesting. She was beautiful & tortured.